This manual request from Mr.Joe Vanage especially for the Samsung Galaxy Tab 3 10.1 (Wi-Fi) manual or Samsung GT-P5210 User Guide. The pdf manual is available and support for english also spanish language. The tablet runs on Android 4.2, Jellybean operating system. It's equipped with 3.2 MP rear camera and 1.3 MP front camera. The camera features such as Effects, Geo tagging, Panorama, Self-portrait, Self-timer, Smile detection, White balance, Exposure value, and Metering. This tablet available for USA, United Kingdom, Asia, Europe, Australia, and South America regions. The Samsung Galaxy Tab 3 10.1 has physical dimensions of 9.57 x 6.93 x 0.31 with weigth are 17.99 oz. There is 1 GB of RAM and 16 GB of ROM. The tablet is powered by Dual core 1.6 GHz processor. It has 10.1 inches, LCD (TFT), 800 x 1280 pixels resolution and support 16.7 million colors. The connectivity consist of Bluetooth 4.0, Wi-fi 802.11 a/b/g/n, HDMI and USB. The tablet support for apps like Dropbox, Flipboard, Google+, Play Store, Polaris Office, and YouTube. 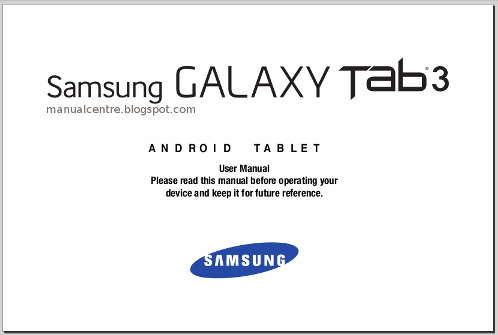 The Samsung Galaxy Tab 3 10.1 (GT-P5210) User Manual consist of 214 pages with file size of 5.42 MB. In this manual provide reference information such as about Turning Your Device On and Of, Setting Up Your Device, Creating a New Google Account, Using Google Maps, Troubleshooting Guide, Using Home Screen, Using the Handwriting Feature, Using Google Voice Typing, using Contacts, using Gmail, google talk, google+, using messages, Google Search, Play Books, and play magazines. Then about Play Music App, using camera and video player, using wi-fi and bluetooth, Connecting With Samsung Kies, using chrome, game hub, Play Movies & TV, samsung apps, polaris office, phone settings guide, safety, warranty and more.